Very similar pattern as the last days with strong ridge still dominating the Arctic region while upper lows continue traveling across the southern half of Europe. One low is over Turkey while another one is centered over the W Mediterranean. 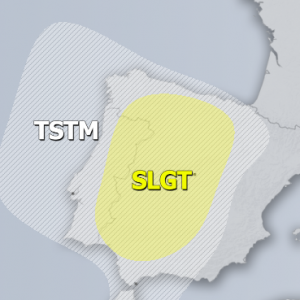 SLGT risk has been issued for SSW Mediterranean, S Sardinia island, S Tyrrhenian sea into NE Algeria / N Tunisia with threat for severe storms, capable of producing severe winds, torrential rainfall, waterspouts and marginally large hail along the eastwards moving cold upper low. 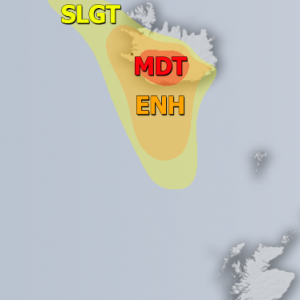 SLGT risk has been issued for extreme N Croatia into E-CNTRL Slovenia with threat for excessive rainfall, resulting along the very slow moving convergence zone. 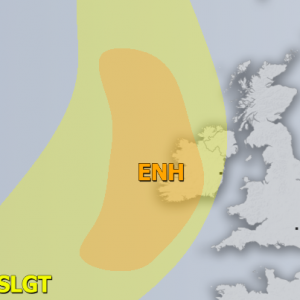 Both convective and stratiform rainfall could lead into local flash floods. MRGL risk has been issued for E Croatia, S Hungary into N Serbia and NW Romania with isolated threat for torrential rainfall and marginal hail accumulation due to slow moving storms. 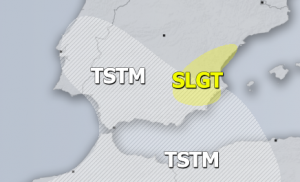 SLGT risk has been issued for E Turkey with threat for severe storms, capable of producing severe winds, large hail and torrential rainfall. MRGL risk has been issued for central Spain and N Portugal where threat for isolated severe storms with severe winds and marginal hail exists. Strong shear but low instability could lead into some organized fast-moving storms.